Only ownCloud enables admins to set document classification rules and then, based on the defined classification, take action to enforce those rules. With the risk to sensitive data a major concern to most companies, IT administrators need a solution that balances the needs of the users and the security it provides. 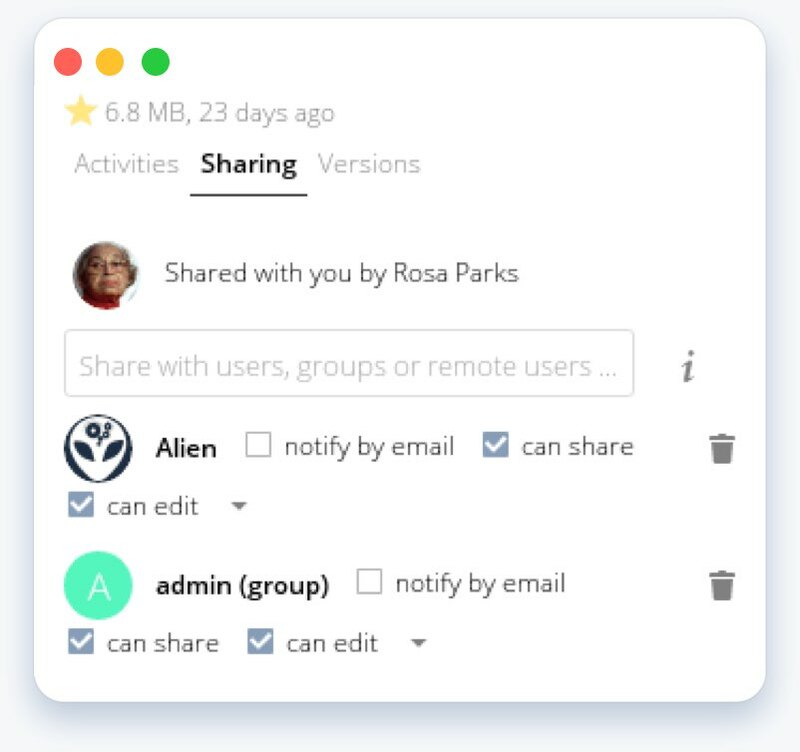 Whether assigning system tags, preventing file access, or retaining files for compliance reasons, ownCloud lets admins control and manage data on their terms. ownCloud offers a number of authentication methods to keep sensitive data out of the wrong hands. Say you want to use a specific authentication solution or multiple solutions, but you don’t want to have to change your desired solutions in order to provide a secure EFSS solution for your end users. So you select ownCloud, as it provides the out-of-the-box integration with your desired SSO/LDAP and authentication solutions. And ownCloud’s APIs mean that if you choose to change your authentication solution in the future, ownCloud’s extensibility will let you move forward without a hitch. Built-in wizards allow IT to integrate ownCloud with Active Directory or LDAP or ownCloud enables customer to choose custom authentication mechanisms as needed for their environment. Single Sign On (SSO) is supported as well as Shibboleth, a SAML-based authentication that is integrated with ownCloud’s web-front end and the ownCloud mobile apps and desktop clients. As users are managed by those services, ownCloud automatically acquires and implements the associated authentication. The ownCloud File Firewall provides a policy engine which protects files from access that does not meet standards. Rules and operators are configured by the admin based on attributes of a request, and such rules can also add a log operator so that the result of a rule evaluation can be logged to ownCloud’s log file for reporting. 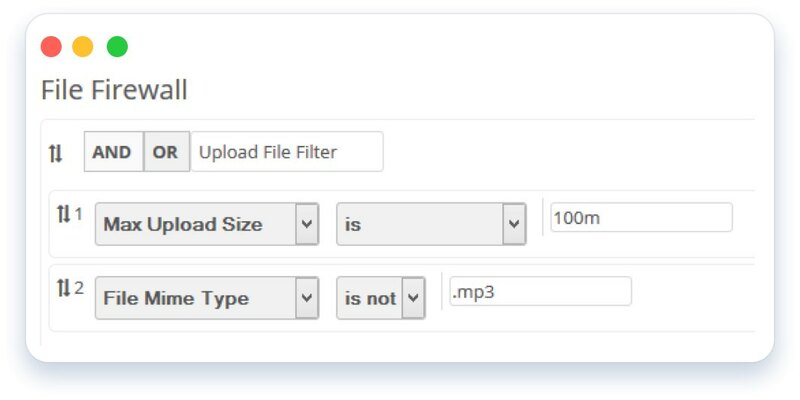 A File Firewall rule can also evaluate a tag on a file and allow or not allow a file to be downloaded based on the tag and the specific file request. With ownCloud’s on-premises solution, IT knows exactly where the data is and who has access to it at any given point in time. This is not the case with cloud-based solutions – the data may even be stored outside of a customer’s country, which may put them at risk for regulatory requirements. The risks of data leakage, security vulnerabilities, compliance violations and business damage are enormous – and well documented! With ownCloud, IT has the ability to decide the value and sensitivity of any class of data, and determine where it should be stored, whether onsite or in the cloud– and the requirements for sharing. IT may decide that certain non-sensitive corporate data is okay to be stored in a Dropbox-type application, while more sensitive data needs to be managed by an on-premises solution like ownCloud. 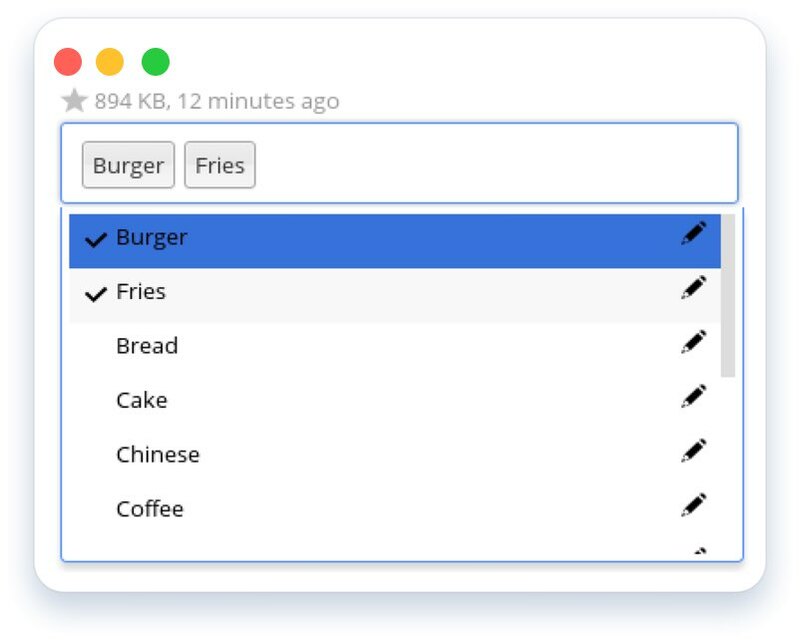 Tags can be assigned by a basic rules engine in the ownCloud admin panel with a feature called auto-tagging. Admins set specific tag types and define tag names, then author rules on when to apply tags. This same admin page allows an admin to determine when to permanently delete a file based on tags. Visibility of all file sharing is critical for maintaining regulatory and judiciary compliance. The ability to maintain an audit trail and set alert conditions ensure IT will be able to support the business requirements of compliance while providing enhanced productivity for employees. Not only does ownCloud allow IT to control each user’s permissions, but it also enables a full audit trail—allowing IT to understand how, when and where data is accessed and shared. Admins can log account level activities such as logins to ownCloud as well as what users do with files on the server. This provides basic information needed for compliance reporting and auditing of ownCloud usage, and the tools to actively follow file sharing activities.